The app used by thousands and thousands of iOS and OS X developers to localize their applications. Generate the Localizable.strings file with the list of strings to be translated. Merge the strings as soon as the translators will provide you the translated strings. With a simple and easy user interface. There's no clutter here. How to internationalize an OS X/iOS app. How Localizable Strings Merge can literally save you hours of work. Drop your source folder on the left and your .lproj folders on the right and let it go. Keeps things clean and preserves comments. Great work! Does one thing and does it well, good buy! It simply updates your localizable.strings file with any changes made to your source code and marks the new strings. It's easy to use and works. Can't ask for much more. Avec cette application la phase de localication de projet devient on ne peut plus simple : en quelques actions élémentaires les fichiers de localisation sont mis à jour et immédiatement utilisables. Je recommande vivement cette application. 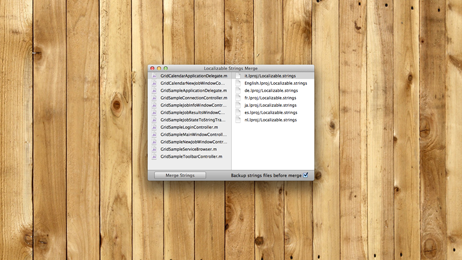 This app makes it really easy to update the localization files from your project. Drag, drop, click, done! Very quick and easy. Thanks!